Roy Lichtenstein: A Pop Remix is set to raise awareness of the American artist’s innovations in the field of printmaking. No graphic aesthetic has swept into the public consciousness like Roy Lichtenstein’s. Born of popular culture, his thought bubbles, dots and women in distress have themselves morphed into contemporary culture in the way of a never-ending loop. Tellingly, when Jaklyn Babington, curator, International Prints, Drawings and Illustrated Books at the National Gallery of Australia, was working with street artists not so long ago, their most commonly cited influence was Lichtenstein – an American, who worked out of a studio, who came to prominence half a century earlier and who was no longer alive. “It’s his aesthetic and instantly recognisable style but also his classic pop subject matter,” Babington, who has now curated an exhibition on the legendary artist himself, said. Fifteen years on, Babington has spent the last nine months working her way through the Lichtenstein component of the NGA’s Kenneth Tyler Print Collection, a collection that contains close to 230 Lichtenstein works spanning almost to 30 years. The resulting exhibition, Roy Lichtenstein: A Pop Remix (currently at Mornington Peninsula Regional Gallery before it travels to QUT Art Museum and Araluen Arts Centre later in the year), concentrates on 80 of Lichtenstein’s prints and print projects and also features a selection of film and photographic stills that show the artist at work and the collaborative aspects of his printing practice. Lichtenstein used to say he was interested in the cliché, whether that be romance and war comics, Picasso’s Cubism or Abstract Expressionist brushstrokes. He would then tweak that cultural phenomenon (with text – “I don’t care! I’d rather sink than call Brad for help!” – but in other ways as well) so as to amplify the “cliché” but also to lend it a critical complexity that accounts for the lingering appeal of his imagery. 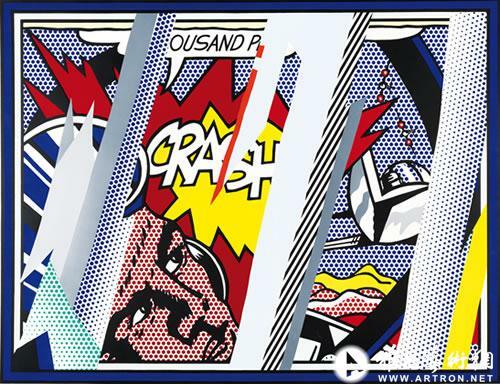 Over four decades, Lichtenstein proceeded to apply his black outlines, flat colours and dots to advertising imagery, common objects, foodstuffs, comic strips, lettering, the work of famous artists, art-historical movements, landscapes, architectural ruins, explosions and more. They were all archetypes to him. The earliest works in the travelling show date from the 1950s and, while pre-Pop, Babington maintains they form an “intriguing precursor” to what came later. Depicted in Lichtenstein’s then expressionist hand, a 1953 woodcut of warships in battle hints at the emphasis on pattern and decoration that came to the fore almost 10 years later. The explosive force of a cannon-shot is shown by the use of short diagonal strokes that have something of the touch of those in his epic 1963 fighter-jet painting Whaam! (the text of which reads “I pressed the fire control ... and ahead of me rockets blazed through the sky…”). Similarly, his 1956 lithograph Ten Dollar Bill might be loose and gestural but it does tackle the overtly Pop subject of everyday currency and America’s ever-growing consumer culture. “It visually teases by teetering on the brink of Lichtenstein’s imminent surrender of the abstract for the figurative; of Abstract Expressionism giving way to Pop,” Babington writes in the catalogue essay. We go over the brink fast enough, however, and by the early 1960s Lichtenstein was finessing his cheap-printed-reproduction look and parodying cartoons at his first New York solo exhibition at Leo Castelli Gallery. In 1965, Lichtenstein told the late British art critic David Sylvester that his shift in style started after he put images of Donald Duck, Mickey Mouse and Bugs Bunny within his Abstract Expressionist paintings. Lichtenstein would make a drawing from an original cartoon or group of cartoons (“they range from being completely made up by me to being very close to the original,” he told Sylvester) and then project the drawing on to canvas, working first in pencil and then paint. As well as painting, however, from the very start Lichtenstein was making prints too. At first these prints were simply invitations and commercial posters advertising his exhibitions (such as Crak! with its red-beret-wearing servicewoman firing her rifle and speaking French). While these posters and the early 1950s prints were made by Lichtenstein working alone, in 1969 the artist began working with American master printer Kenneth Tyler, an association that would last for the rest of Lichtenstein’s life. Working with Tyler, Lichtenstein regularly chaffed at the boundaries of what was technically possible or deemed good practice. When for instance he replicated Monet’s painted haystacks as a series of prints in 1969, Lichtenstein deliberately mis-registered his dots from two separate plates to create an optical reverberation on the printed surface. This meant, Babington says, that he was not only referencing Monet’s late 19th-century Impressionism, but also parodying the current Optical Art movement. It wasn’t a quick process, and some prints took up to two years to be completed. As he himself once said, it was hard to do a picture that was “despicable enough that no one would hang it”. He didn’t succeed there.